Q From Sally Marden: Thank you for a fabulous site! I stumbled on it while looking for the derivation of Old Dart, since I am a Brit living in Australia and had no idea why the locals referred to England so. However, since finding that, I’ve been asked by an Ocker where the term Old Blighty comes from, and was appalled to realise I had no idea. Can you help please? That’s the conclusion of Her Majesty’s government, which acknowledged yesterday that letting pubs stay open past the traditional 11 pm closing has failed to curb old Blighty’s notorious binge-drinking problem. Boston Herald, 5 March 2008. Bilayut, Billait. Europe. The word is properly Arabic Wildyat, “a kingdom, a province,” variously used with specific denotation, as the Afghans term their own country often by this name; and in India again it has come to be employed for distant Europe. ... The adjective bilāyatī or wilāyatī is applied specifically to a variety of exotic objects ... most especially bilāyatī pani, “European water”, the usual name for soda-water in Anglo-India. Hobson-Jobson; The Anglo-Indian Dictionary, by Sir Henry Yule and Arthur C Burnell, 1886. The title of this book needs explaining: the expression hobson-jobson was once used by British soldiers in India for any “native festal excitement”, as the authors described it. They explained that it was a corruption of the Muslim exclamation Yā Hasan! Yā Husayn! during the Muharram procession; Hasan and Husain were the grandsons of Muhammad who were killed while fighting for the faith. Blighty was the inevitable British soldier’s corruption of bilāyatī, meaning Britain in particular. 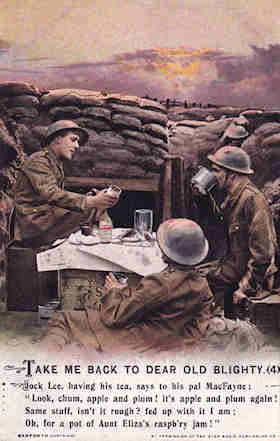 But it only came into common use as a term for Britain at the beginning of the First World War in France about 1915. It turns up in popular songs There’s a ship that’s bound for Blighty, We wish we were in Blighty, and Take Me Back to Dear Old Blighty, as well as in Wilfred Owen’s poems and many other places. Though old was added at the time, Old Blighty has become more common since then, especially among Australians of British origin, in the same way as it appears in Old Country and Old Dart, as a sentimental reference to the UK.